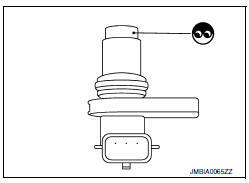 P1078 EXH TIM SEN/CIRC-B1 (Exhaust valve timing control position sensor circuit bank 1) An excessively high or low voltage from the sensor is sent to ECM. Start engine and let it idle for 10 seconds. Is 1st trip DTC detected? YES >> Proceed to EC-359, "Diagnosis Procedure". Disconnect exhaust valve timing (EVT) control position sensor harness connector. Check the voltage between EVT control position sensor harness connector and ground. Check the continuity between EVT control position sensor harness connector and ECM harness connector. Check the EVT control position sensor. Refer to EC-360, "Component Inspection (EVT Control Position Sensor)". NO >> Replace EVT control position sensor. Refer to EM-60, "Removal and Installation". Disconnect EVT control position sensor harness connector. Remove EVT control position sensor. 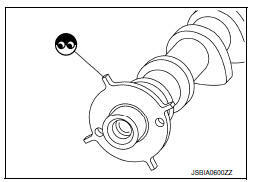 Check resistance EVT control position sensor terminals as shown below.